With the success of the Lido Limo/Shuttle NEV car with the wheelchair lift, Western Golf Car noticed an opportunity for developing a special wheelchair shuttle vehicle for use in airport terminals. The packaging requirements of this vehicle to fit the wheelchair lift and platform, a driver, two passengers and luggage was a big challenge and necessitated a vehicle with a footprint unlike any vehicle in production at that time. For these reasons it was necessary for me to design the vehicle frame from scratch. It was constructed of welded steel tubing and was more simple to build and stiffer than the purchased frames that Western typically used and extensively modified for larger footprint models. The track width necessitated by the lift mechanism was larger than any vehicle yet built and required extensive modifications to the front suspension and rear axles. Although the vehicle had only a small compliment of running and warning lights, I had to design completely new main (12v) and motor controller wire harnesses. The wheelchair lift mechanism was designed and built by the Western distributor in New Zealand. After consulting with a representative from American Airlines we were astonished by how heavy a weight the lift mechanism needed to handle for some passengers, and I had to coordinate a re-design of the lift mechanism to increase the capacity. After this was carried out by the manufacturer I verified the capacity by testing it with the platform filled with batteries to get the target weight. Although the lift mechanism was out-sourced, I had to design the platform and ramp mechanism. I had to increase the width of it too (another surprise) after meeting with the man from American Airlines, but fortunately it was still on the "drawing board" when this occurred. The platform was designed in aluminum to save weight. 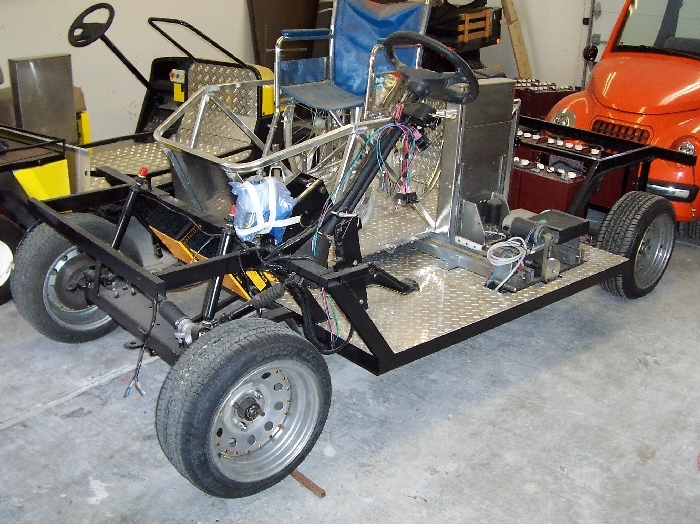 The lead photo shows the running chassis ready to send to the design studio for designing the body. An "industrial look" was envisioned. 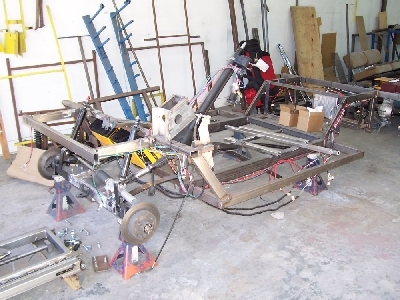 This program lead the way to Western designing and building proprietary chassis in-house. This is the car under construction. Since a standard (non-automotive) steering column was used, I had to design a new mounting for the brake pedal and master cylinder. Some of the work to widen the front axle can be seen. A part of the wheelchair lift mechanism can be seen sitting on the floor in front of the car.